Okay, don't these just look pretty? You could serve them up as a side to some Hawaiian Pork Shish Kabobs or Fired Up Pork Ribs or as an appetizer. I'm thinking a 4th of July picnic or barbecue may feel just a bit fancier and be a bit healthier with these Watermelon Bruschetta with Marinated Basil Cucumbers & Feta in place of a bag of chips. FYI: Just as fair warning, these yummy appetizers are, not surprisingly, a little messy between the watermelon juice and the cucumber marinade. Be sure to serve on a plate with adequate napkins. Start with your bruschetta. You'll need approximately one quarter of a medium-sized seedless watermelon, rinds removed and sliced into small 3/4 inch thick rectangles.Basil Cucumber Marinade 1 large or 2 small cucumbers quartered and chopped. 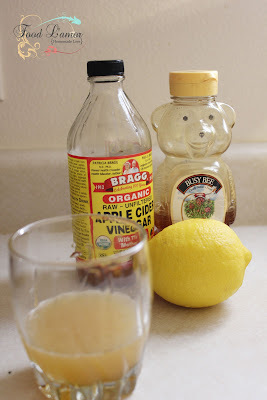 About 2 cups worth1 small sweet onion, finely chopped (I used a Vidalia onion, but a sweet red onion works too) 1/4 cup raw honey1/3 cup apple cider vinegar1 tbsp. olive oil1/2 tsp. ground mustard1/2 tsp. sea salt1/4 black pepper1 garlic clove, minced3 sprigs parsley, chopped (or 1 tbsp. dried parsley)5 basil leaves, roughly chopped (chopped extra if you have it for garnishing)Chop the cucumber and onion. In a bowl, combine all the ingredients for the marinade and whisk together. Pour over the cucumber and onion and stir. Put a lid on and set in the fridge for 1-3 hours to marinate. When you're ready to serve, set the watermelon bruschetta out on a plate and top each with a tablespoon of the cucumbers. Sprinkle a little crumbled feta cheese and the extra basil on top. This can serve a crowd, but is best cold so only put it all together when you're ready to eat. Enjoy! The first little sunburn of the year after an afternoon playing at the park reminds me that spring is coming to an end and summer is almost here. It also reminded me of this time a year ago, right after Miah was released from Primary Children's Hospital for Celiac crisis. They had just removed the PICC line that had been sending nutrients straight into her veins and she was finally gaining weight and eating again. My sweet neighbor at the time, Guilma - who also happened to be a chef and mother of a child with Crohn's disease - invited us over for a tea party and to teach me how to make some yummy gluten free dishes. She walked me through making tapioca rolls and spring rolls. We ate them all as we sipped raspberry tea sweetened with big globs of honey. The leaves in the mountain just above my house are an explosion of beautiful fiery reds and oranges. It's official...it's FALL!!!! I love this time of year. There are many wonderful things about fall such as: kids are in school, the windows stay open and let in cool night breezes and I get to light my pumpkin spice candle. And one of the best parts is the food. I try to cook and eat what's in season and this time of year there are so many yummy, colorful things to eat. Just look at what's in this warm side salad. This is fancy enough for entertaining with a balsamic vinegar reduction drizzled over top. Plus you can grill up some chicken and toss in with it to make it a light dinner. I can't believe I haven't put this recipe on my blog sooner. I love quinoa, but especially with tomatoes roasted in balsamic vinegar, olive oil and Herbs De Provence. This warm salad is a perfect side to something grilled or by itself as a light meat free dinner. Eat it right away while it's nice and warm or munch after it's cool. Either way it's filling, healthy and oh so yummy! I love mango salsa. I love mango anything really. So why not make your own homemade mango salsa. This is my kids favorite way to eat lunch. Throw some food on a platter: pick, dip and eat! I usually make this simple rosemary hummus to go along with the veggies and pita chips. The fruit and cheese are just to round things out!Rosemary Hummus:1 can garbanzo beans (or any white beans you like), drained and rinsed1 tbsp dried rosemary or 2-4 fresh rosemary sprigs, leafs stripped1 clove garlic1-2 tbsp extra virgin olive oilsalt and pepper to tastePut everything but olive oil in food processor and blend for a minute. Then add oil a little at a time, blending as you go until everything is incorporated. Salt and pepper. To kick it up a notch, use crushed red pepper flakes instead of black pepper. That's it! Serve with sliced celery, carrots, bell peppers, pita chips or tortilla chips. * Beans kind of have it all. Fiber, check. Protein, check. Iron, vitamin B, antioxidants and other trace minerals. Check. Remember that obnoxious song you used to sing when you were a kid. "Beans, beans, the magical fruit the more you eat. . ." You probably know the rest, but as obnoxious as that song was it's remarkably accurate :) It's true that the more beans you eat "the better you feel."